A few weeks ago I was invited with a long time colleague, Laurie Donnelly, to coffee by a mutual colleague and friend, Jessica Pedemont the chocolatier, for a very interesting discussion with baker Cesare Salemi of “Dust” Café & Bakery at the Glebe Tramsheds. Cesare brought out some of his bread made from freshly milled stoneground. Cesare grinds his own flour through a stone mill in his bakery. We were duly impressed by the depth of flavour and aroma of his bread. Cesare calls it “living nutrition” and urged me to try it. I was keen to discover more. So I contacted the company with an excellent reputation, Skippy Grain Mills. 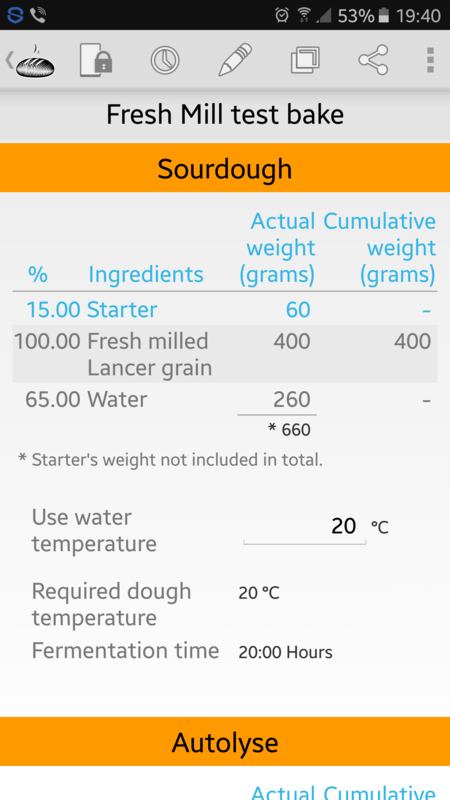 I wanted to try it for myself and show stone milling wheat at home. Home milling wheat with a stone mill then baking the bread using that fresh stoneground on the same day of milling is very doable at home. I wondered if I could significantly capture more of the flavour and aroma of the Lancer wheat variety in bread baked with freshly stone milled Lancer grain. Professional bakers like myself have been subject to ‘group think’ for some time. After all we are to some extent a product of our time. In the case of many professional bakers we’ve been educated, in and by, the industrial baking tradition as well as the “mandarins” of the baking industry, the cereal scientists. Those scientists have led the way for technology and methods as well as the research underpinning that paradigm. Some of the technology, in my opinion, is useful for the sole reason that it gives us a clue what to avoid. However some is sound baking knowledge and research that has yielded valuable information we wouldn’t otherwise have. But I can’t help thinking it has also led us down some very narrow dead-end streets. Making bread from fresh stone milled flour is a case in point. 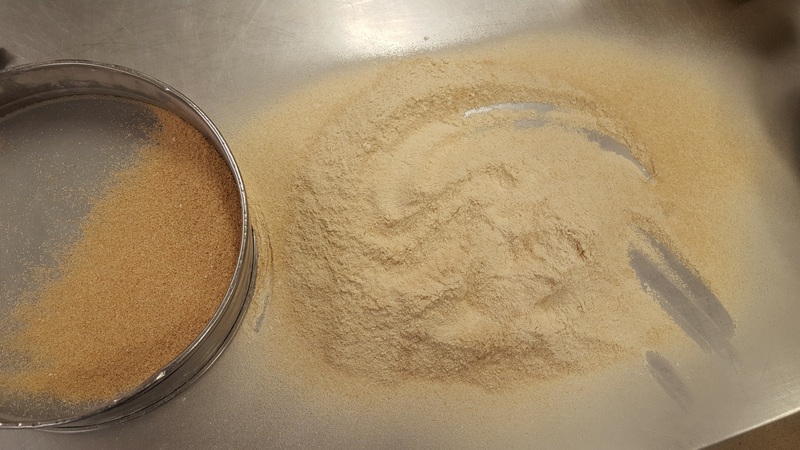 Conventional wisdom has stressed allowing fresh milled flour to age or oxidise to improve its baking properties. 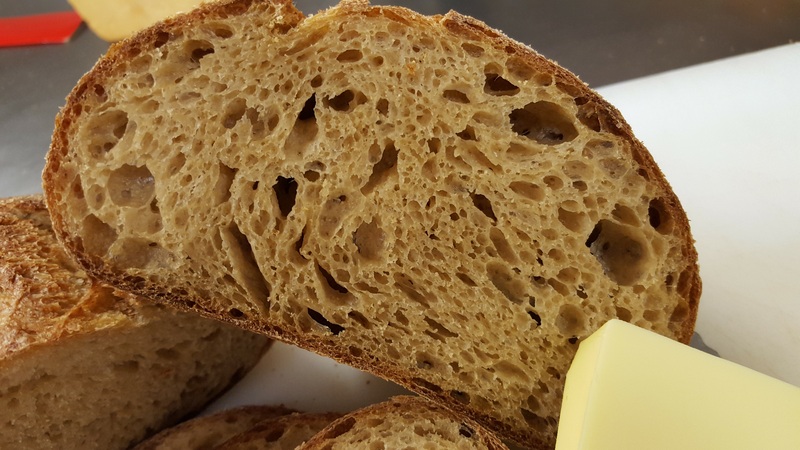 While I have been taught the science of ageing flour to increase the incidence of sulphur bridges between amino acids in gluten molecules which increases its ability to retain gas and able to expand more robustly, it overlooks some of the story. 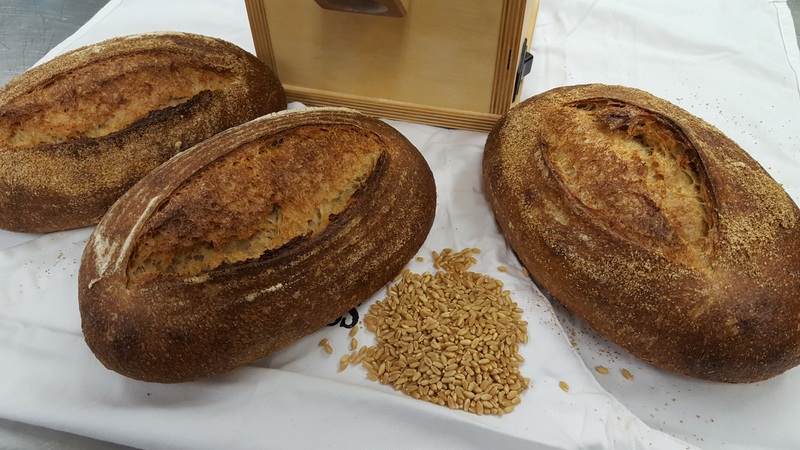 Although its baking ability (improved bread volume and tolerance) improves with age, it’s also clear that the nutritional and organoleptic properties of fresh milled wheat deteriorate as the ageing process advances. Of course it’s expensive to keep flour stored for longer periods to effect natural ageing so using “maturing agents” at commercial mills and bakeries is more common than most people think. So not only do we lose the flavour, aroma and nutrition, we also take in substances we may not be aware of. Nor do we know for certain if they are detrimental to our health! I’d rather err on the side of caution, wouldn’t you? Of course stoneground isn’t new to me but using it on the same day it is milled to try and capture all the subtle aromas, flavours and nutritional value is, I have to admit! I just had to get my hands on a stone mill and bake some sourdough bread using stoneground flour as fresh as I can possibly make it. Skippy Grain Mills are reliable suppliers in Australia of the best German and Austrian stone mills money can buy. The cost is very reasonable when you consider what it really does and the results yielded. I used the Hawos Billy 100 mill. Its a handsomely made mill showing excellent workmanship of beautiful birchwood. The hopper and exterior furniture is beautifully made. The internal components are of first class quality. Its very compact but powerful, quick and easily fits on a kitchen bench. Since I wanted to use the flour as fresh as I could, I milled enough for the sourdough only and made the sourdough 1 hour after as I wanted the flour cooled to room temperature. 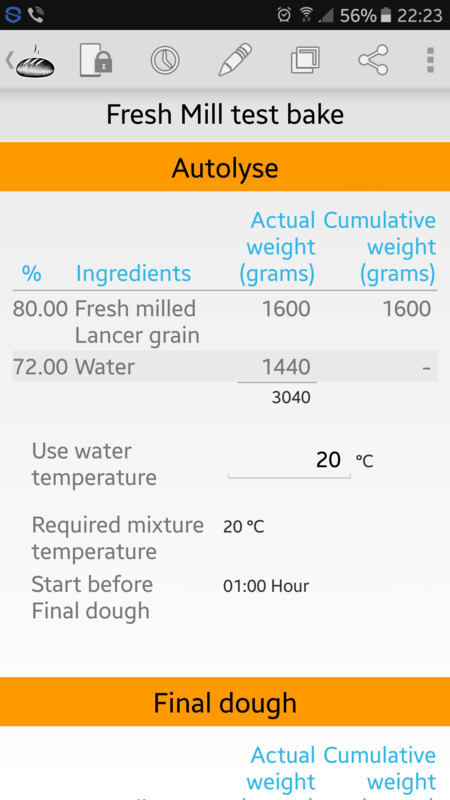 After milling I noted the flour temperature. I was pleased to note that passing through the mill the flour was well below the problem temperature of 55°C which means the flour maintains its integrity and the maximum nutrition. Besides that being important I wanted the bread dough to be on the cool side around ~ 23°C. So I allowed the flour to cool on the bench which is just one step to produce better controlled fermentation.The next day I milled enough for the final dough and again after it cooled I made the final bread dough. The grain was sourced from Provenance Flour. The variety of this wheat is called ‘Lancer’ which is considered an Australian Prime Hard (APH) wheat. All Australian wheat varieties are classified by code depending on their utility, characteristics and where they are grown as geography is very influential in wheat quality. Incidentally, see the single variety bake test where Lancer and Spitfire varieties, both classified as APH, were baked and compared. 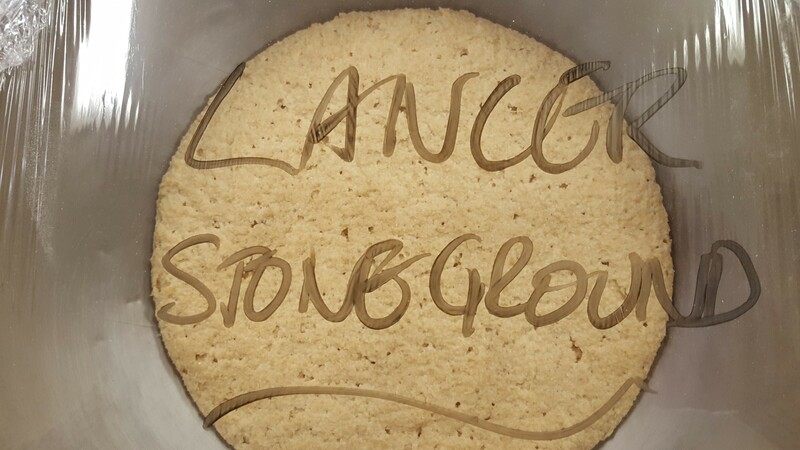 APH Wheat “Lancer” variety from Provenance Flour. Origin: the North Star Grown by : Simon Doolin. Fresh milled Lancer on the right. Lower temperatures of stone milling preserves as much of the fragile vitamins and micro nutrients as possible. Milling the flour was an experience in itself. The wheat aroma released was unique. Sieving, I extracted 56g of the coarsest bran from 1656g of the meal. This equates to approx 3.5%. This means the flour used in the autolyse was 96.5% whole. However, my thinking was to use the bran on the outside of the loaf for effect and flavour. This will mean I’ll reduce dusting of the bannetons but still incorporate the bran albeit in a different way. Mature sourdough ready to add to the final dough. The autolyse was used to help gluten formation and bonding. As stoneground has a relatively large amount of small bran particles as well as all the alurone with an abundance of proteins as well as soluble fibres. I expect ‘soaking’ the flour will help gluten bonding and yield a better texture and volume to the bread. The final dough is a combining of all the previous steps with the addition of any remaining ingredients, in this case salt. Salt was added at the completion of mixing. The dough formed and developed very quickly. One thing I paid close attention to was the dough temperature. In this case I kept it very much on the cool side as you can see the RDT ~ 23°C. 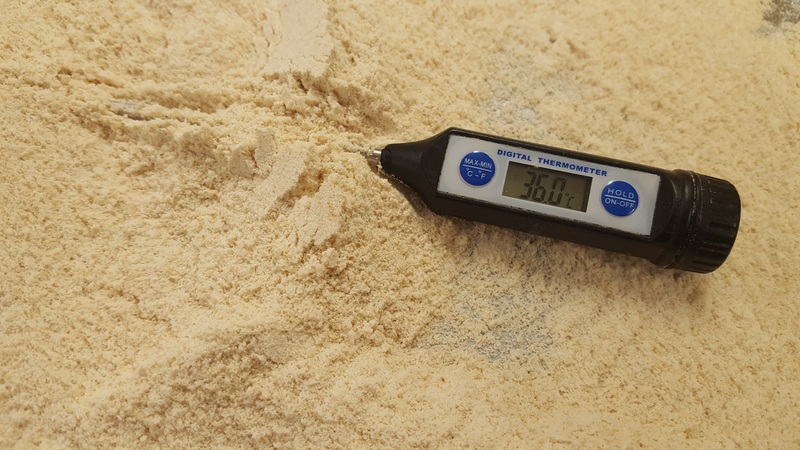 Cooler dough temperatures help keep the gluten elastic and resilient which is very important considering we are using fresh milled stoneground. During mixing I soon became aware that more water was necessary so I added more water. After making the dough and finally adding salt the dough was folded several times and allowed to rest before folding again. Bulk fermentation of 3 hours was given. It was then scaled and tensioned by rounding up and allowed 30 minutes intermediate proof. Final moulding was executed. After final moulding I rolled some of the dough pieces into the bran I sieved after milling. The dough pieces were put into refrigeration overnight in a covered banneton to slowly ferment during final proof. In the morning it was allowed to rest at ambient temperature for 4 hours of final proof. So by the afternoon we tasted and evaluated the bread. It was an understatement to say it was aromatic and flavoursome. The complexity of the flavour was something to behold. The crust was a mixture of a wheaty sweetness with some subtle acids. The depth of the grain flavour is hard to describe in words. I’ve tasted many types of bread made with many types of methods but fresh milled stonground using sourdough is unparalleled in flavour. It’s a truly unique flavour experience. The crumb was moist, elastic, beautifully flavoured and coloured. It was very pleasant as the moisture and sheen of the crumb indicated the water level was close to being perfect. Although I feel even more water can improve the texture. I will be doing this again soon, but do I believe this grain can perform better? Of course, but it’s pretty darn good as it is now! Next time using this grain variety I’ll reduce the percentage of starter in the sourdough from 15% to 5%. These variations should be fine for this grain using the same time frames as those times suit my daily schedule. 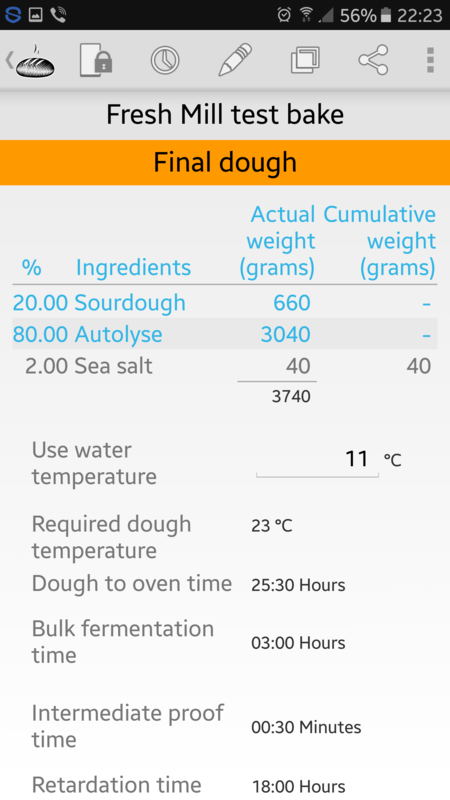 If I wanted I could use the same quantities as before but I’d need to reduce the times of each stage excepting the autolyse as the times in the sourdough fermentation is where any over maturity can occur. 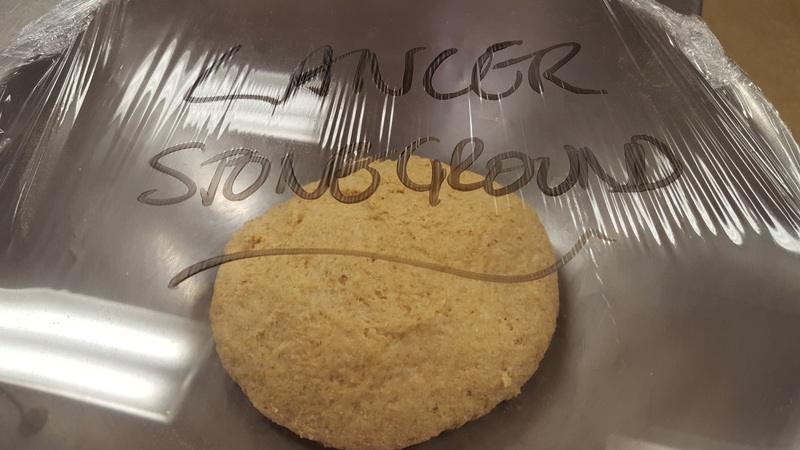 Since fresh milled stoneground is rich in nutrients the fermentation is accelerated and the protein usually has less tolerance so a reduction in time or sourdough level is required. For me it’ll be the sourdough amount as the time frames work best in my daily schedule. Remember there is a correlation between time and sourdough seeding level. 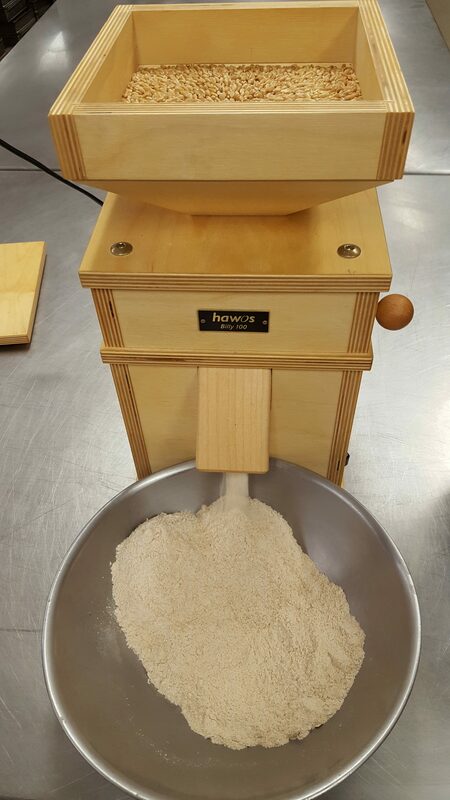 The mill performed beautifully and milled the grain with no problem at all. It was hypnotic watching the grain magically turn to flour right before my eyes. Every part of the process of baking is a satisfying endeavour when one considers the resultant bread. But here in this instance the real highlight was the quality of the bread. The flavour, aroma and mouth-feel is nothing short of amazing, but considering the nutrition of the bread, that makes it somehow ethereal. I’m also looking forward to milling more single origin grains, spitfire wheat, rye and spelts and use it fresh to capture the beautiful flavours and aromas. I’ll keep you posted on that in a follow up. I encourage you to try fresh stone milling and baking. There’s no doubt its a challenge, but the results when you get it right are nothing short of amazing. Nice article Boris so true about the baking industry here having such a narrow mindedness and scope. Loaves look awesome. Makes me excited about making good bread after reading! I guess at the time industry was a product of that era and the prevailing philosophies, but thankfully things are starting to change. Hi there Boris I am after some feedback re the mill u are using. 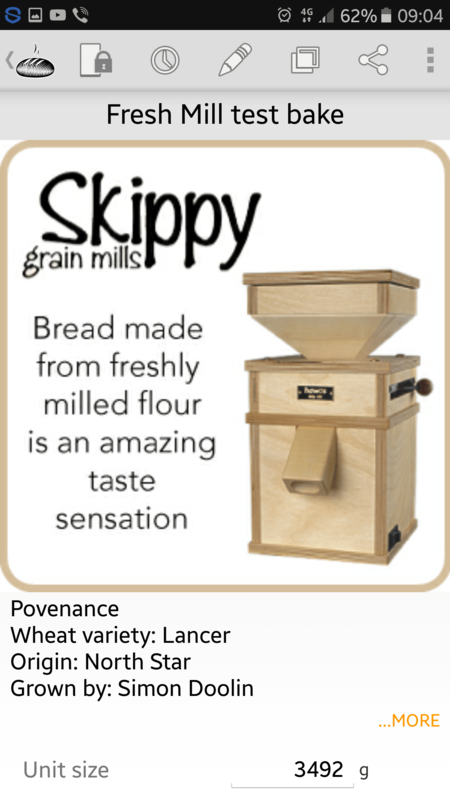 I am a lecturer at Regency Tafe in Adelaide and we are looking at purchasing a small industrial mill so we can teach our students how to mill grain and use it in breads – pretty much like your video highlights. We have contacted Skippymills to enquire about a possible purchase but thought I would just touch base as to your thoughts on the Hawos Billy 100 mill? Lovely crumb by the way!! For our use – domestic – the Hawos Billy 100 mill is great. We’ve had very good results. We use it for a variety of breads including dark rye typical of northern Europe. It’s a well made mill in every sense, outside and inside. However, having said that, for teaching students, larger quantities would be the norm and in that case I’d ask John from Skippymills for a bigger beefier model. Better to have excess than insufficient capacity.